You're in the middle of doing something on the Google Play Store and suddenly you're prompted with an error message telling, 'Unfortunately Google Play Store has stopped.' You've got no choice but to tap OK and exit the app, whether or not you're done using the application. If you too will or have encountered the same error while using the Play Store, here's how to fix it. 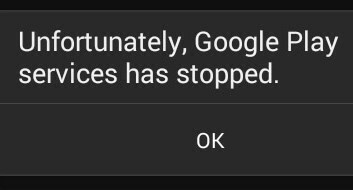 If this is the first time you encounter this error prompt, then you can try a soft reset or restart your device. Some users find a simple power cycle on their phone works good at fixing the problem. The error tends to be triggered by some corrupt data in an application. As resolution, navigate to your phone's Settings menu, go to Applications, and then open the Application manager. When you're in the Application manager screen, swipe your finger to the left until you see the All Tab. From this tab, scroll down and tap Google Play Store. Tap the button to Clear data and/or Clear Cache. Many Android phone users have deemed the above procedures as general solution to the emerging problem. The option to Clear cache erases all saved files (settings and accounts), including corrupt contents that are fetched upon launching the application. This process won't affect the app's data though. Clear Data, on the other hand, affects the app's data including passwords, account settings and preferences. Another workaround if clearing the app's cache and data won't fix the problem, is to uninstall any Play Store updates. Some updates may also contain bugs that cause the app to become unstable or misbehave. To uninstall Play Store updates, go to your phone's Settings->Apps->Google Play Store, and then tap the button that says Uninstall Updates. Doing so will revert the Google Play Store app to its original version. After uninstalling updates, you need to find another (prior/recent) version of the the Play Store app to download. Going to the Google Play Store page on APK Mirror to download prior version of the app from there is a highly recommended method. Tap to select Google from under Manage accounts section. Tap the Google account you want to remove, and then tap the menu icon represented by three vertical dots located on the upper right. Note: If necessary, do this for every Google account on your phone. Go to Settings->Accounts->Add Account->Google, and then follow the onscreen prompts to complete the process of re-adding your account. As your last resort, in case the aforesaid methods have failed to fix it, you can go for a master reset. The process will wipe out your phone, setting it back to factory defaults. Having this said, creating a backup of all your important files is highly recommended before the process. Thus, you can easily restore them afterwards.